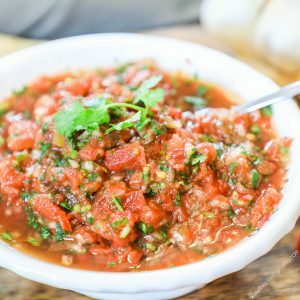 This recipe is a quick and easy salsa that gives you a delicious, fresh, classic salsa taste. You will not be disappointed when you try this salsa. In just 10 minutes you will have your own homemade salsa. Place the onion, cilantro, garlic powder, salt, and lime juice in the food processor or blender and process until very finely chopped. Add some additional liquid from the tomatoes if needed. add the tomatoes and ROTEL to the mixture and pulse about 5 times or until the salsa reaches your desired consistency. Chill for 30 minutes to allow flavors to meld. Enjoy!